1 talkers magazine industry newsletter. Official site with biographies, news, gigs, and photographs. Stephanie Zacharek discusses John Woos ultraviolent paean to the Navajo 'code talkers' who fought with the Marines in World War II. The official home of the band which features Col. Bruce Hampton, including news, upcoming shows, photos, and a message board. Information on the 'code talkers' depicted in the movie, with links to photographs, maps and the official Marine Corps history of the Saipan battle. a collection of radio shows for sale or (preferred) trade. offers two radio shows a month (in downloadable realaudio), otr trivia, radio museum and history of radio. quarterly publication, dedicated to do-it-yourself broadcasting of all types: microbroadcasting, pirate radio and tv, internet radio, public-access radio and tv, shortwave radio, and college and high-school radio and tv. Chronicles the plan of Beast Wars fans to present the voice actors with action figures for each of their characters. Includes photos. radio history in the uk from 1920 until today, paying tribute to the bbc and independent local radio, station histories, personalities plus radio receivers including crystal sets, transmitters & coverage maps. a look at radio history in the uk from 1920 until today, paying tribute to the bbc, bbc local radio and independent local radio. website is hub for several projects of net420, including pirate radio, canyon lake radio legal developments, web radio, and guru klyphs 'virtual religion'. news, links, audio. this is a ring for free radio web pages including support for free radio, free radio programs, broadcasting, or anything pertaining to free radio, lpfm, amateur and microbroadcasting. experience the history of broadcast radio including both news and entertainment. plus a monthly updated timeline of broadcast radio and many links to other radio-related material. offered from the listeners point of view. with reviews and comment on british radio, internet radio, and podcasting. pop music radio from the 1960s, 1970s, and 1980s. includes audio and this month in radio history. cultural global radio clearinghouse cataloguing and archiving the best of internet radio. radio news and online trade magazine for the radio record business. humor and current events based radio program. broadcast 6-10 am central and offered in syndication to any and all radio stations. news, information and resources from advocacy organization favoring broader public participation in radio and low-power radio broadcasting, and opposed to industry consolidation. web-site linked to web-radio station celebrating vintage british land based pirate radio stations of the 60s 70s & 80s. The leading media group in the Basque Country with four television channels and four radio stations. ETB 1, ETB 2, ETB Sat, Euskadi Irratia, Radio Euskadi, Radio Vitoria, Euskadi Gaztea. a listing of shows with streaming audio largely available on the internet. they originate from terrestrial radio stations, internet radio stations, satellite radio stations, and radio networks. internet-only radio station playing eclectic music 24 hours/day and providing links to hundreds of world radio sites. rolling bay radio - a low power radio station on bainbridge island, near seattle. broadcasting on 49.830 mhz. we are about good music and we stand for the right of all to have access to the airwaves. If the business hours of talkers magazine in may vary on holidays like Valentine’s Day, Washington’s Birthday, St. Patrick’s Day, Easter, Easter eve and Mother’s day. We display standard opening hours and price ranges in our profile site. We recommend to check out talkers.com/ for further information. 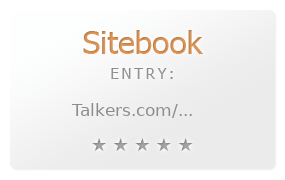 You can also search for Alternatives for talkers.com/ on our Review Site Sitebook.org All trademarks are the property of their respective owners. If we should delete this entry, please send us a short E-Mail.